Lawn mowing and landscaping season is here. From a small yard to an entire complex, we can do it all. New customers receive 10% off on mulch and your first cut is free. Call or email for a quote. Have you got winter debris in your gutters? We also clean gutters. Call us now. Green Thumbs Lawn and Landscaping! Green Thumbs Lawn and Landscaping, LLC is a family owned and operated newly established landscaping company. The president of Green Thumbs Lawn and Landscaping, Robert Ignatowski Jr., has been working in the landscaping business for over 10 years. 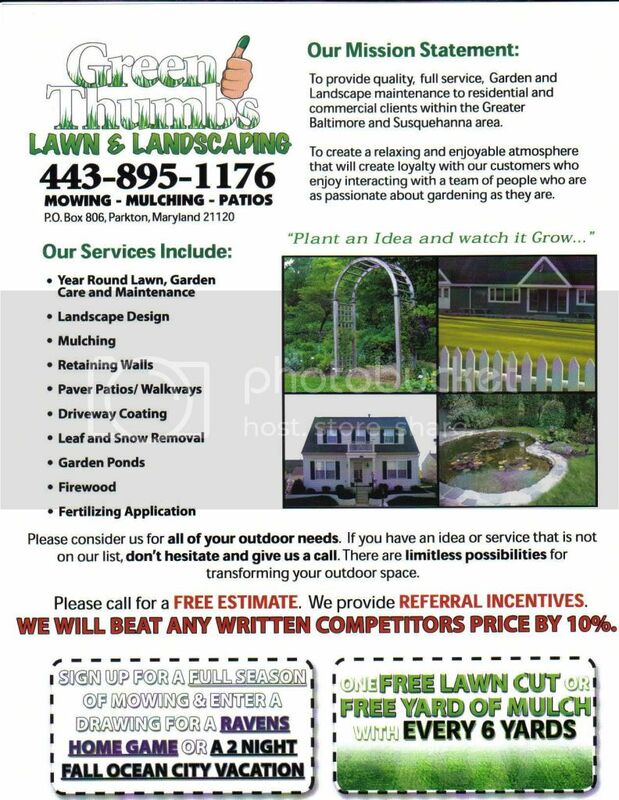 We Take great pride in providing quality, full-service garden and landscape maintenance to residential and commercial customers within the Greater Baltimore and Susquehanna area. We strive to create a relaxing, enjoyable atmosphere that will gain loyalty with our customers who enjoy interacting with a team of people who are as passionate about gardening as they are. We have a team of highly skilled professionals that believe in establishing a strong foundation and relationship with each customer. They will work directly with you to build an everlasting outdoor sanctuary that you can enjoy for years to come. Green Thumbs Lawn and Landscaping prides itself in the quality of work we perform with a “Green Thumbs” guarantee. How do other homes have picture perfect landscaping? We do it for them at an affordable price! We are the only choice. Is your back breaking from mowing and landscaping? We'll do it for you at a phenominal rate! Have a business property? Let us maintain it! We offer affordable weekly and monthly rates. Don't let Winter be a problem. Let us do your snow removal!